The Russian language, like many other languages, has many words that derived from the names of geographical places. The French province Champagne gave the name to all sparkled wines in Russian. 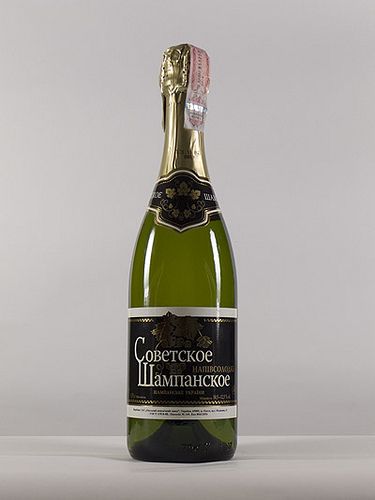 Though French wine-makers insist that only wines produced in Champagne can be called Champagne, in Russia the word “Шампанское” (Shampanskoye) became the label for all sparkled wine. Same happened to Cognac. The noble brandy from the France became the category name. Any brandy, including Greece’ Metaxa and famous Armenian brandy, are called “коньяк” (konyak) in Russia. Port wine, the wine made in the Portuguese city of Porto, shared the fortune of Champagne and Cognac. Despite the international regulations, the whole sort of sweet fortified wines are named “Портвейн” (Portwein) in Russia, doesn’t matter where they were made. The word Скотч (Scotch) competes with the general name “Виски” (Whiskey), though the latter is more common. Since whiskey is not so popular in Russia as Cognac or Port, there’s no well-established word for this class of beverages. The word “одеколон” (odekolon) came to Russian from the French “Eau De Cologne” that meant “the water from the Cologne” (a German city). The word was inherited about two centuries ago, and today not many Russians know its origins. Also, not many people would recall the Spanish isle Menorca when adding mayonnaise (“майонез” in Russian) to their salads. Geographical places gave names not only to beverages and food where they were originated from; some types of clothes and footwear also inherited their names either from real countries of origins or from what people thought was a place of origin. Thus parkas, a type of heavy jacket with a hood, in Russia are called “аляска” (alaska), and flip-flops, an open type of outdoor footwear, sometimes are called “вьетнамки” (vietnamki, after Vietnam). Like in English, capri (pants), bermuda (shorts) and bikini undewear in Russian are “капри” (kapri), “бермуды” (bermudy) and “бикини” (bikini) correspondingly. What names Russia gave to the world? These are gzhel (гжель), a style of ceramics which takes its name from the village of Gzhel, and khokhloma (хохлома), a wood painting handicraft named after a trade settlement Khokhloma. Sometimes I meet the word “Russian” as a name alone with “dance”, “dall” or “soup”, but all these things has their original names that have no word “Russian” in them: “казачок” (kazachok), “матрёшка” (matryoshka) and “борщ” (borsch). The list of words that brought world-wide fame to the geographical places is by no means complete. Would you like to continue listing with examples from your language?